We're not your usual fire department. Click on any image below to launch the photo viewer. The 2018 Meltdown officially came to an end on Tuesday, April 17th at 8:37PM. The winner is Georgia McCarthy with her pick of April 17th at 8:13PM. Sue Asher of Worthington was actually closer with her pick of 4/17 at 8:56PM. But as long-time contest participants know, we use “Price is Right” rules which means that the winner is the closest to the actual time the clock gets disconnected without going over. Most of you are painfully aware that our recent weather has been anything but normal with cooler than average temperatures, predominantly cloudy skies and several bouts of snow showers which generally dampened the mood. Last Saturday (4/14) was a gift from the heavens – a mostly sunny day with temperatures hovering near 50 degrees. I received a text in the afternoon from my neighbor saying that the block had gone down. I stopped by the gatehouse after dinner to check on the status of the clock and was not surprised to see that the cord had not yet been pulled from the outlet. From what I could tell, it appeared that there was enough force in the wind out of the north during the day that it just pushed the pallet, block and flag over. I also noticed that the ice floe had also been blown south into the dam moving the block closer to shore. I adjusted the tension on the rope, locked the gatehouse and checked on the status of the clock several times a day. Over the next several days, sleet, freezing rain, rain and wind had little impact on the status of the block other than to refreeze the hole it had gone through. On Tuesday night, I stopped at the gatehouse after a fire department drill down in Williamsburg and found the clock un-plugged. The contest was finally over. April 9, 2018 - Are You Kidding Me? Well into the second week in April, opening day baseball games are being postponed, plows are still making passes and folks around here have not put away their shovels because of continued snowfall. 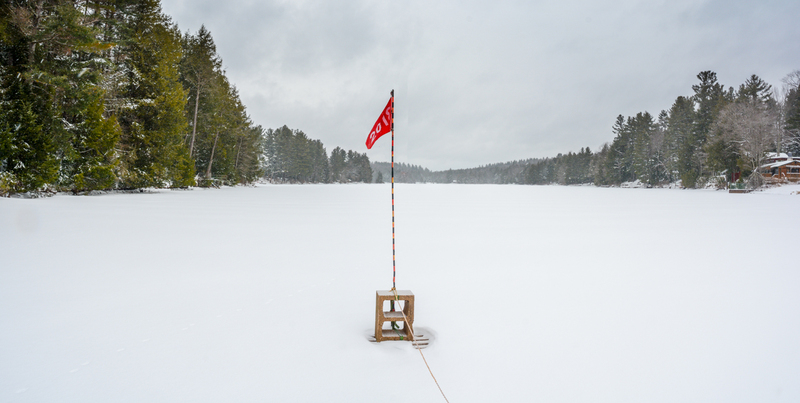 On Easter weekend, I ventured out onto the ice (actually, it was more like slush) to measure its thickness. What I found was a bit surprising because I had never experienced it before. When I put the drill into the ice, it met with little or no resistance for the first 10 inches of so. 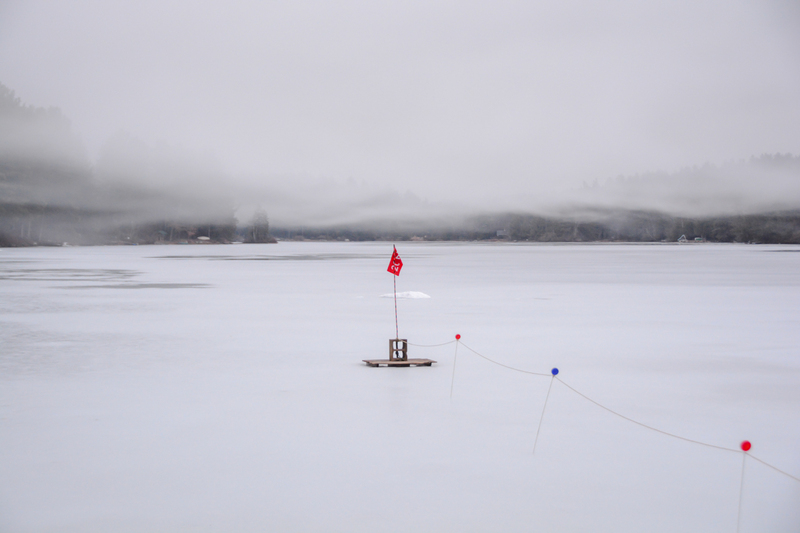 Then, it seemed to hit more solid ice for the next 5 inches. Since that time, we’ve only gotten more snow and colder temperatures. As you can see from the picture below, every step was a new adventure for my heart. Truth be told, I did have a spotter on the shoreline with my phone just in case I went in for a swim. Well, they were also there to save my camera from going down with me. What’s in Store For Us Now? I’m not kidding when I say that we have snow in the forecast for tomorrow. Overnight temperatures for the next two nights are in the mid to low 20’s Fahrenheit. Then, and only then, will we start to see (dare I say?) a warming trend. Local on the air weather personalities are already teasing us with sound bites like ‘When will we see temps in the 70’s? Tune in for my full forecast tonight at 11″. News Flash! It won’t be in Goshen. Friday’s high is forecasted to be 58 degrees. Having done this for the past 13 years, I’ve come to know many of you are procrastinators. I received a slew of envelopes in the mail, in my door, at the firehouse, from people on the street. You name it, they found their way to me. More on those results with the next update. If I were a betting man (which I am not), I would say that we still have at least a week to go before things start to get real interesting. If my hunch is right, that puts this years contest solidly in the “what climate change?” category. Can You Say Open Water? As you can see from the picture above taken yesterday of the north end of Hammond Pond, the open water looks like it’s here to stay. Melting snow coming into the pond from Webster Brook is slowly melting the ice from north to south. In case you’ve never been here, there’s still a lot of land (or in this case, ice) between the open water and the block. 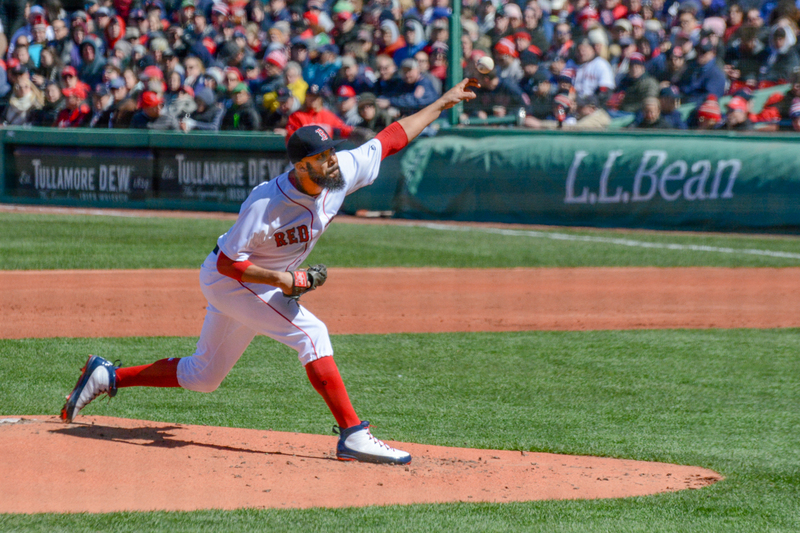 For the record, it was 38 degrees when David Price threw the first pitch at Fenway Park in Boston last Thursday. When I left Goshen at 9AM, snow was everywhere in sight. When I walked up the ramp to our seats at the ballpark, all I saw was Fenway Green. Those of you who have been there know what I mean. The calendar may say it’s spring, but snow flurries over the weekend and overnight temps in the teens say otherwise. Even though there’s open water a the Oxbow in Northampton, there’s still lots of ice in Goshen. The March sun is clearly having an impact by melting the snowpack. 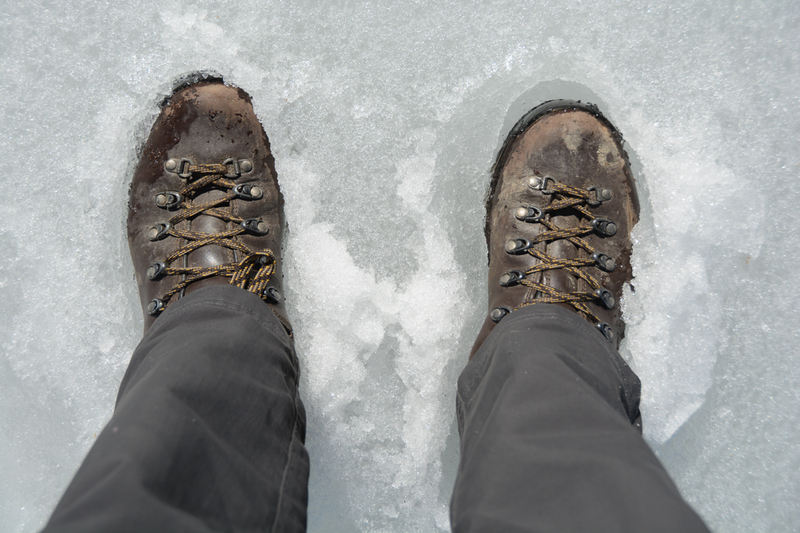 However, freezing temperatures at night turns the snowmelt into ice. 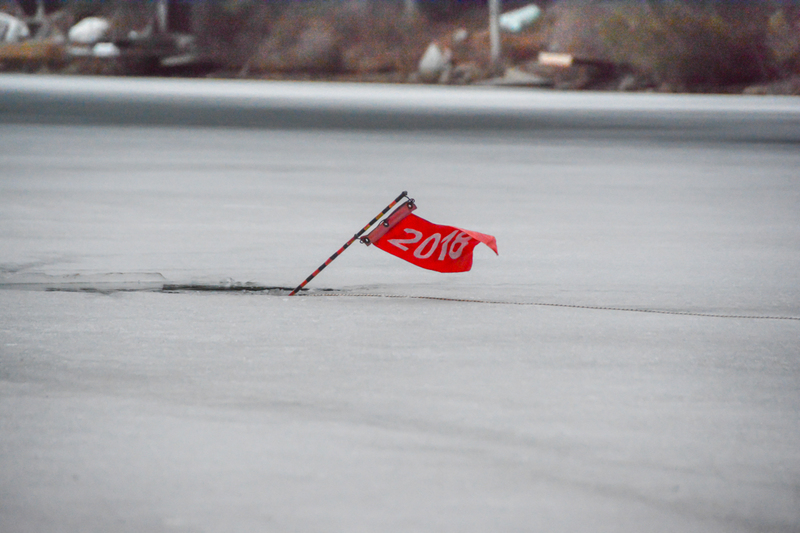 What I can say is that the ice has gotten thicker since last week because my 18″ drill didn’t break through to open water when I tried to get a measurement on Sunday. 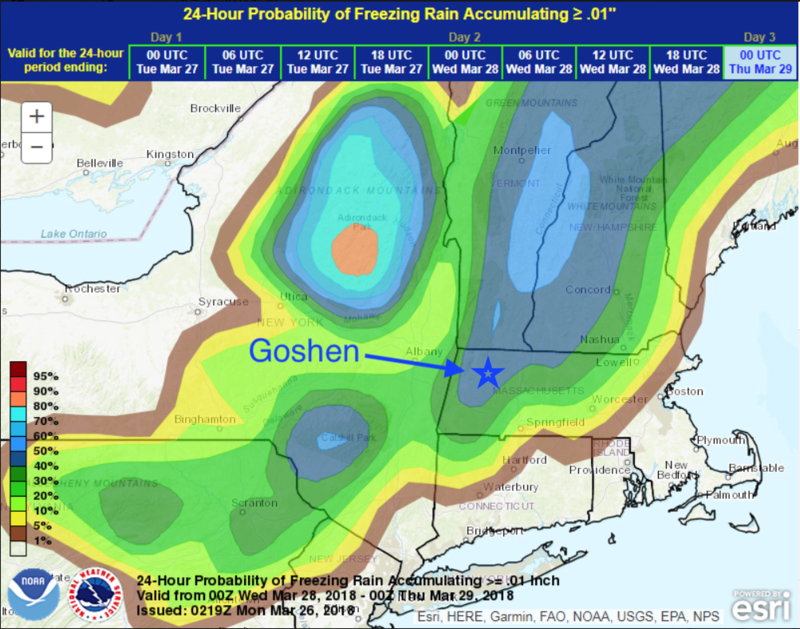 It appears that we might be turning the corner on winter with freezing rain in the forecast for tomorrow night into Wednesday morning followed by a chance of showers each day through Friday. Said another way, after tomorrow night’s freezing rain, we will be above the freezing mark both day and night through the weekend. 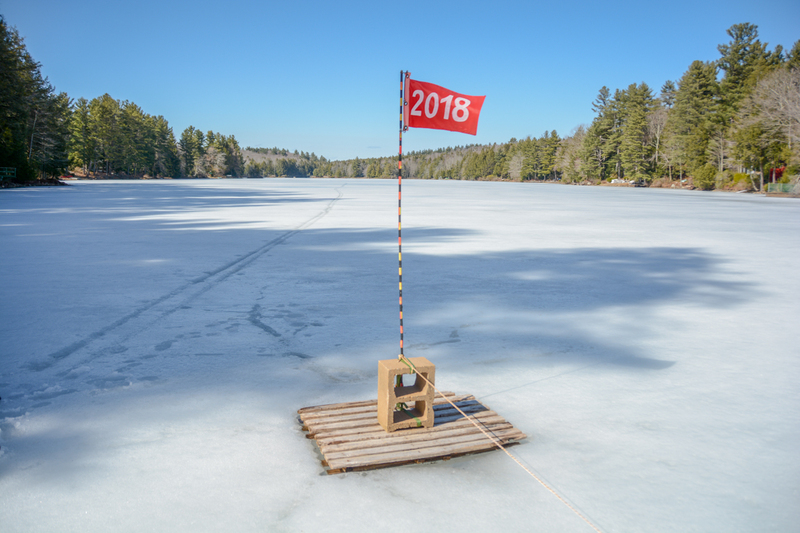 While it’s not quite time to hook up the clock to the rope, I think it’s safe to finally say that geese will soon be returning to Hammond Pond. Oh joy! Not to mention a nice showing from friends much closer to home. Keep in mind that ticket sales end on 4/1 at midnight. March 21, 2018 - Spring is in the Air...NOT! At 12:15 p.m. yesterday, spring officially sprung. However, the 4th nor’easter in the past three weeks is about to bear down on a beleaguered New England. On a day when the sun was directly above the equator and we’re gaining around 3 minutes of daylight every 24 hours, we are still experiencing colder than average temperatures and overnight lows in the teens. 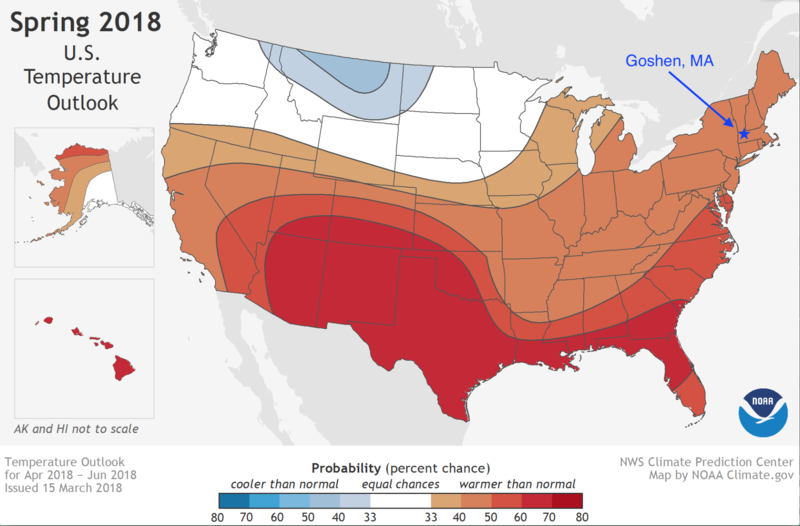 Just in time for Spring, the National Weather Service Climate Prediction Center came out with their temperature outlook for the next three months showing us in a ‘warmer than normal’ area. This is the best evidence yet that it won’t be long before we’re swatting at mayflies. In spite of forecasts showing us in an 8″-12″ snow band, here in south Goshen we received 17″ from last Wednesday’s storm. 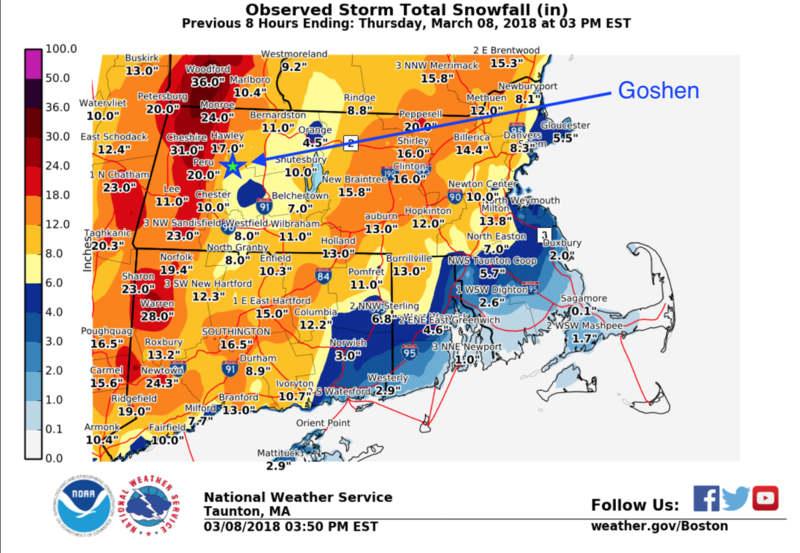 Just a few miles to the north in the center of town, snowfall totals inched closer to 2 feet and you can see in this report from Western Mass News. 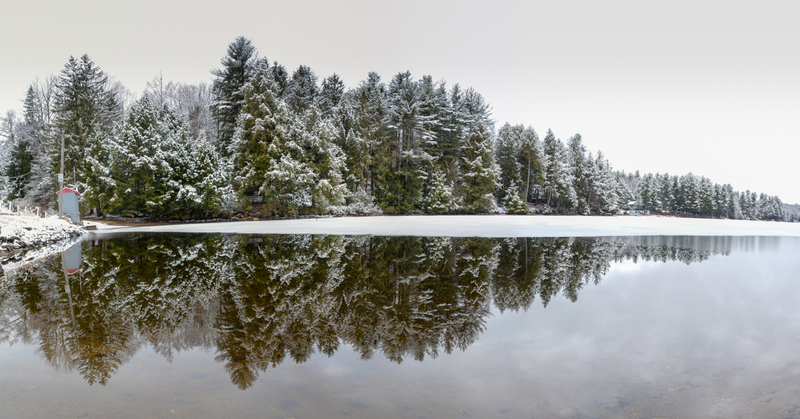 The Meltdown block is located in the southern end of Hammond Pond in Goshen. Hammond Pond is fed from Webster Brook which comes in from the north. Each year, the melting pattern starts from this inlet and works its way down towards the dam. 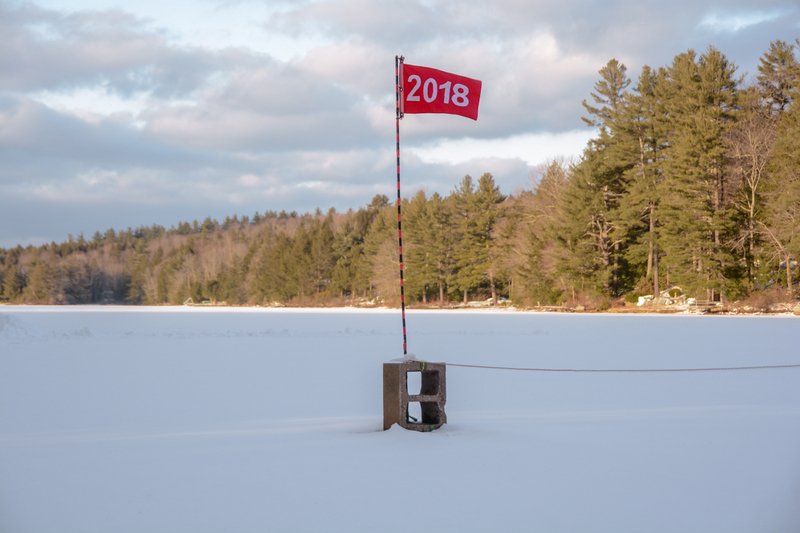 While we’ve seen more open water in this section of the pond recently, the current winter pattern we find ourselves in has re-frozen this area. 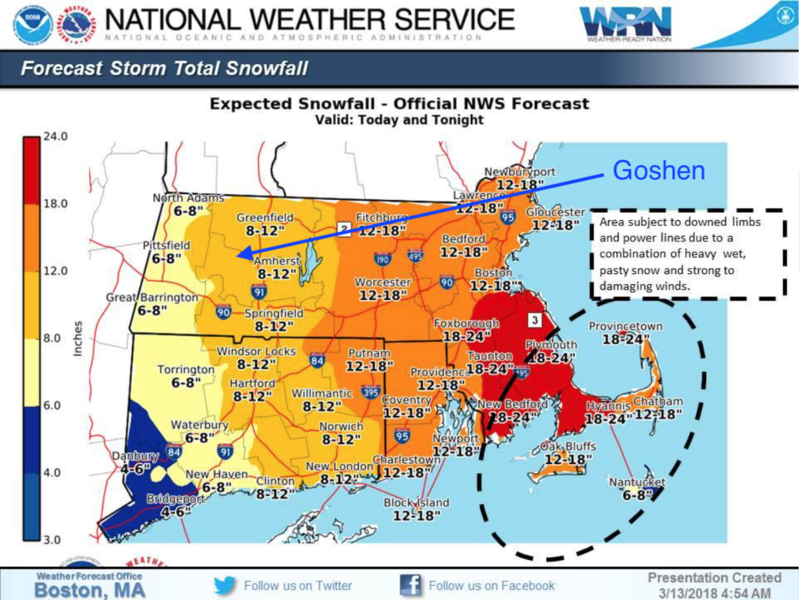 With only one week before spring officially arrives, Goshen finds itself under a winter storm warning. The third nor’easter in less than two weeks is forecasted to dump between 8″-12″ of snow on an already white landscape before it ends tomorrow. 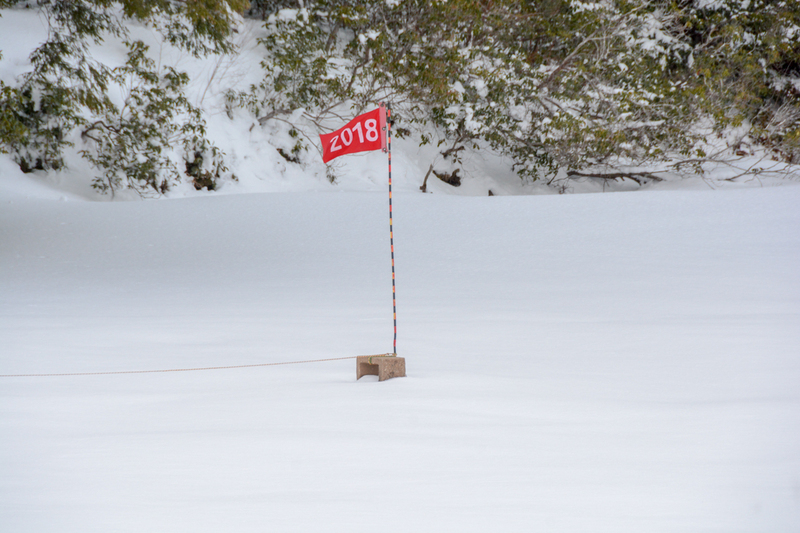 Last Friday’s storm deposited 10″ of snow here in south Goshen. 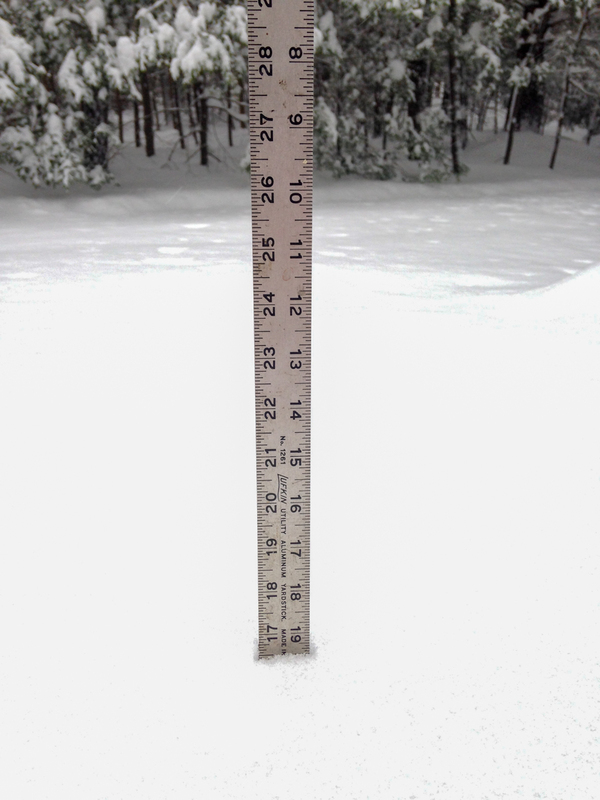 West Goshen, only a few miles away near the Cummington line, was blessed with 14″ of the frozen precipitation. As you can see from the graphic from the National Weather Service, we weren’t too far away from places like Cheshire where they received 31″ of snow. For New Englanders, there’s nothing terribly remarkable about today’s storm. Grab the bread and milk. Plan to go out later today to clear the driveway. Hope that we don’t lose power. Now that we’ve all turned our clocks back one hour, there was enough daylight to allow me to go for a walk around the lake Sunday night after dinner. 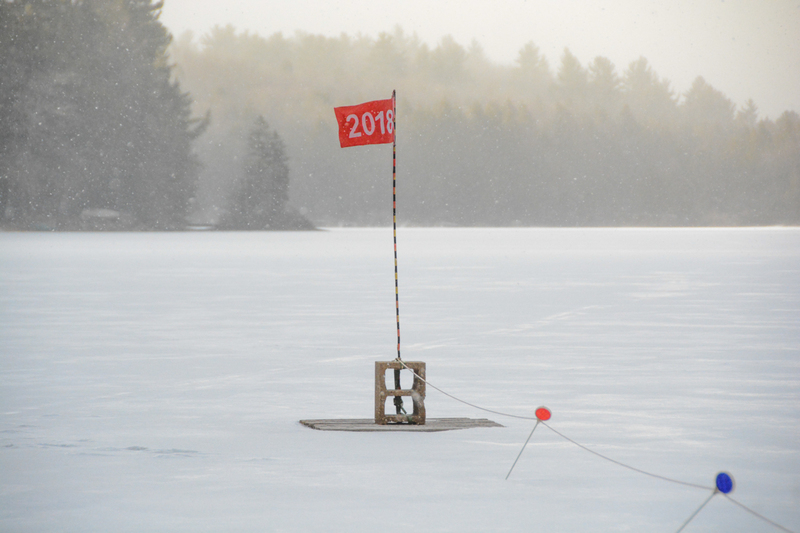 Even though we received 10″ of snow a few days before, the winds that accompanied the storm kept the snow totals on Hammond Pond below that level. 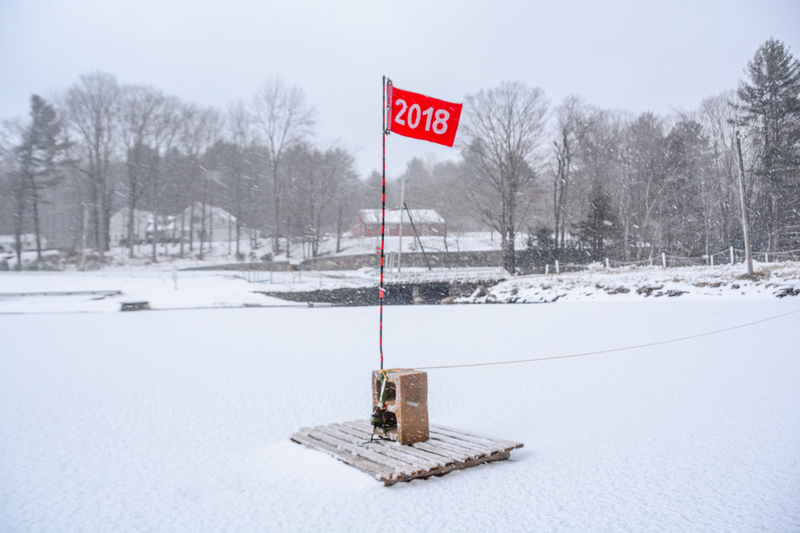 The pallet and base of the block are snow-covered while ice stretches solidly from shore to shore with no breaks at the shoreline. 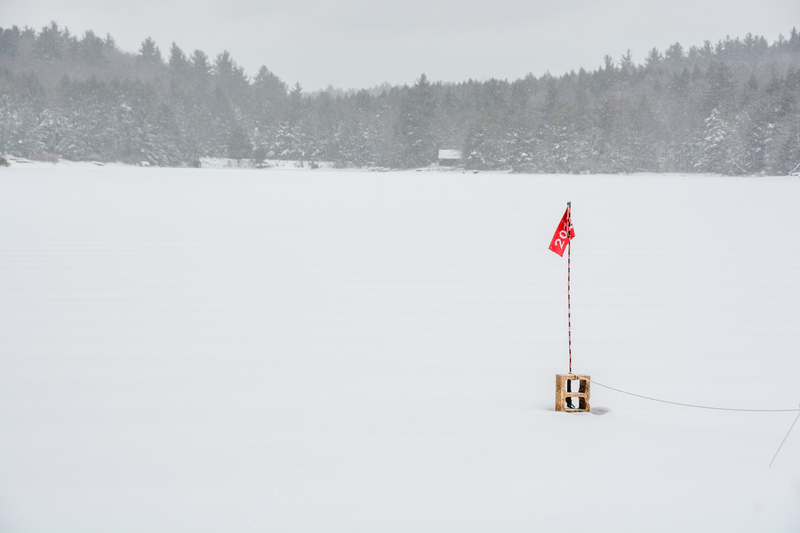 Open water from Webster Brook at the north end of Hammond Pond has now closed in as a result of below freezing temperatures at night. That’s what we woke up to very early Friday morning. 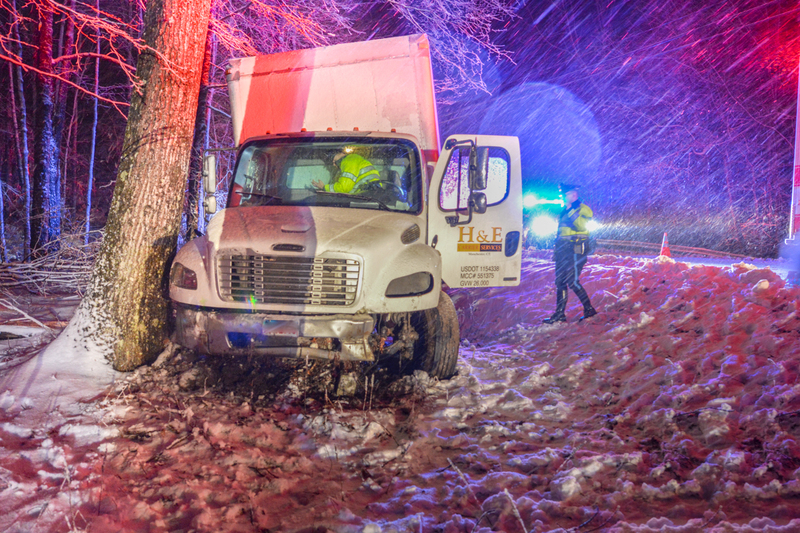 Winter storm Riley hammered the Cape and the Islands with wind gusts that exceeding 90 m.p.h.. Most of the Connecticut River valley and points south were drenched with a dose of heavy rain. Goshen, with an elevation of over 1,000 feet, received 5” of wet snow that coated everything it touched while Williamsburg just down the road ended up with puddles. So far, this winter season has chilled us to the bone with record-breaking cold, re-introduced the word “bombogenisis” to our vocabularies, made us think that spring was just a few weeks away with soaring temperatures in February and brought winter snows and associated northeast winds that toppled trees and took our power away. Many Hilltowners know that above freezing temperatures in the daytime and below freezing temperatures overnight are a wakeup call to our regions maple trees. As a result, sugaring season is in full swing. Looking ahead, winter storm watches have already been posted for our area. Unlike last week’s storm, the question about Wednesday’s event is not whether it will snow or rain but rather how much snow we’ll get. 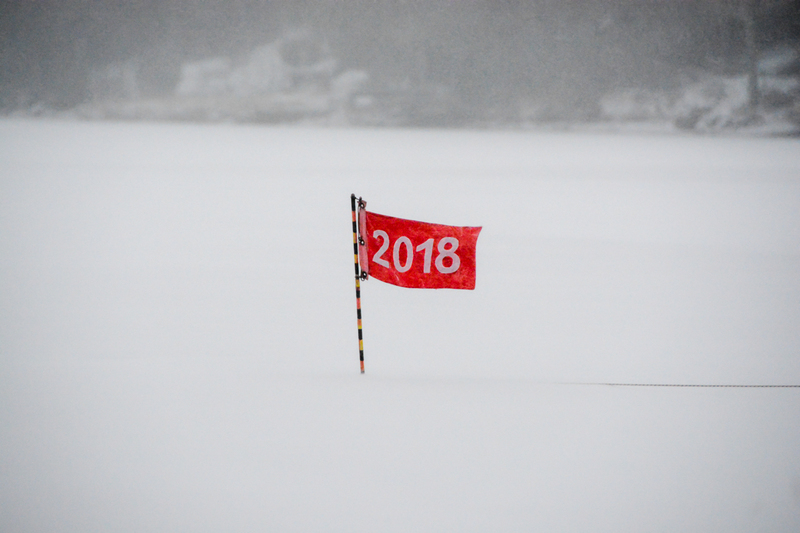 Currently, the National Weather Service has us solidly in the 12” – 18” range. 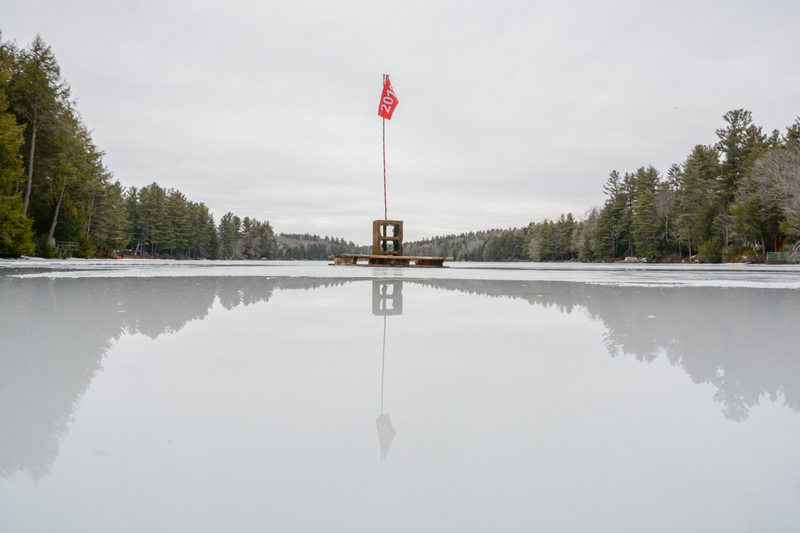 In spite of the recent bout of unpredictable weather, the ice around the block currently measures 15” thick. A storm with this much snow can only add to the duration of our little contest. It was nice to connect with so many of you again after my initial e-mail. February 25, 2018 - The 2018 Meltdown Has Begun! 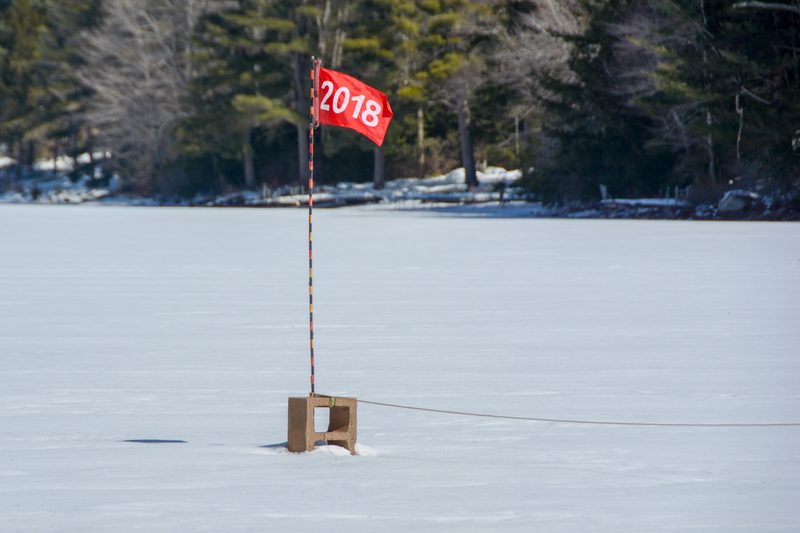 Before it’s too late and the ice is all gone, it’s time to start thinking about spring with the 14th annual Meltdown. The block sits on a wooden pallet that holds a flag. 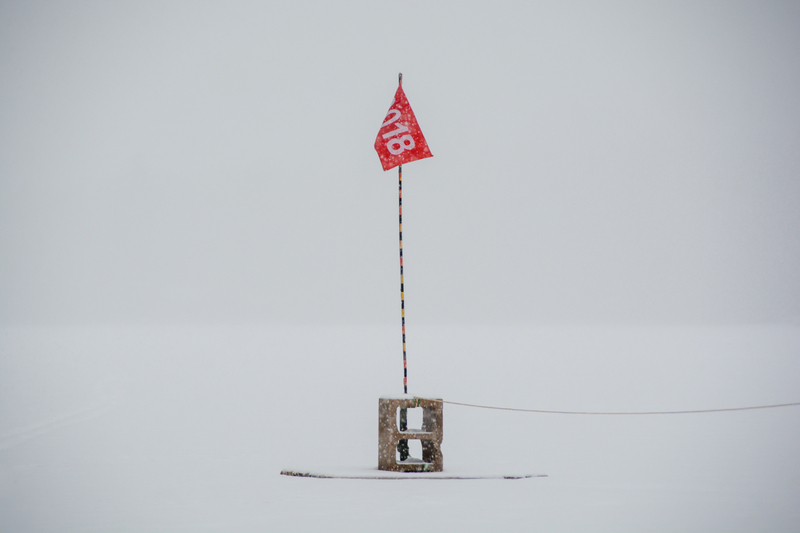 The flag is simply a marker that shows where the block is in the event it gets completely covered in snow. The block is connected to an electric clock by a rope. The clock is plugged into an outlet in the gatehouse on the dam holding back Hammond Pond. 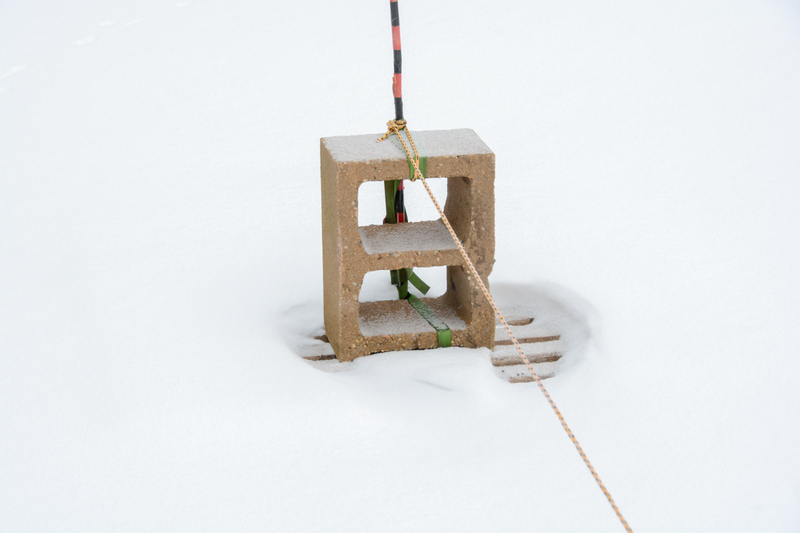 Once the block falls through the ice or the ice floe moves away from the dam, the tension on the cord will pull the plug out of the wall socket and stop the clock. Simple, right? The most popular dates were 4/15 (672), 4/10 (645), 4/12 (643), 4/1 (640) and 4/13 (601). 76% of all guesses have been for dates between March 27th and April 21st. As you can see from the table below, the block has gone as early as March 11th (2016) and as late as April 21st (2007). Since the contest began in 2005, we’ve given away over $9,000 in prize money to the winners. More importantly, the contest has raised over $12,000 for local non-profit groups and events. This year, our fundraising efforts will be directed towards the renovation of the Town Hall kitchen used by the Goshen Women’s Club, the Goshen Council on Aging and many others when the need arises. The existing kitchen has served us well but its 1950’s era appliances are in desperate need of an upgrade. The deadline for ticket submissions is Sunday April 1st at 11:59:59PM. 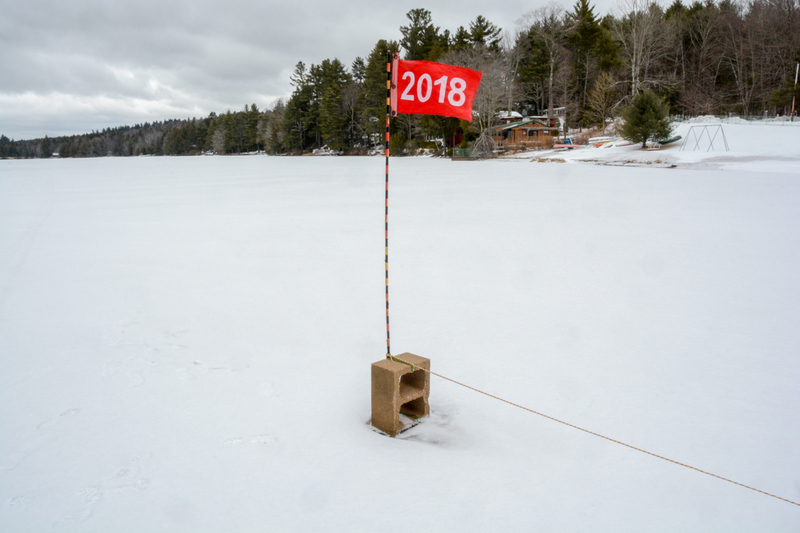 Back in 2016, the block fell through the ice on March 11th – almost three weeks before the deadline. Tickets received after April 1st (unless they were postmarked on or before that date) will be returned. 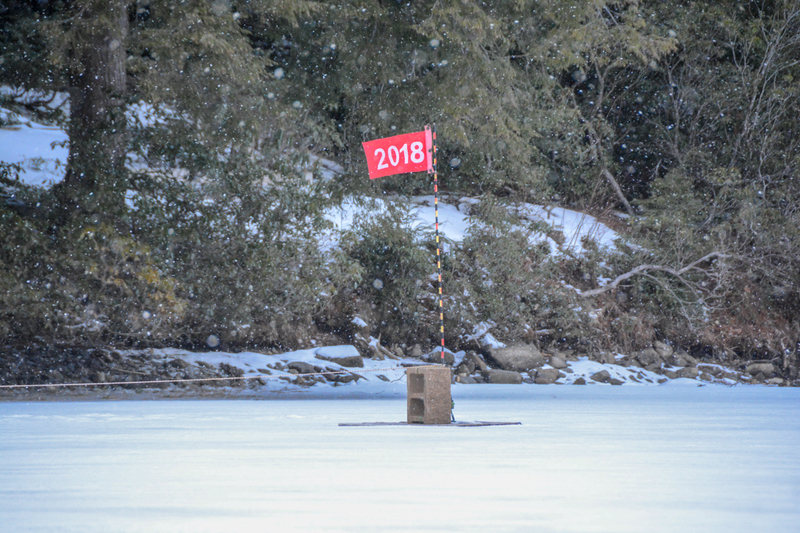 This date is weather dependent and will be irrelevant if the block falls through the ice before the deadline. Copyright © 1999 - 2019 Goshen Firefighter's Association Inc. All Rights Reserved.